You've probably figured out by now that I am a dog lover. But there is a reason. 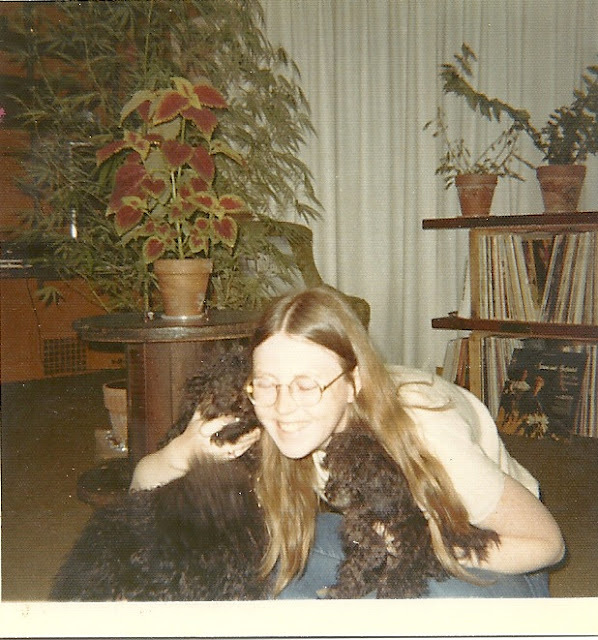 From the age of seven until now, dogs have played a huge role in my life. They have been a comfort in times of grief, fulfilled a desire to love and take care of someone and a great source of amusement. I have also learned from them. So in repayment for all that dogs have done for me, a tribute. 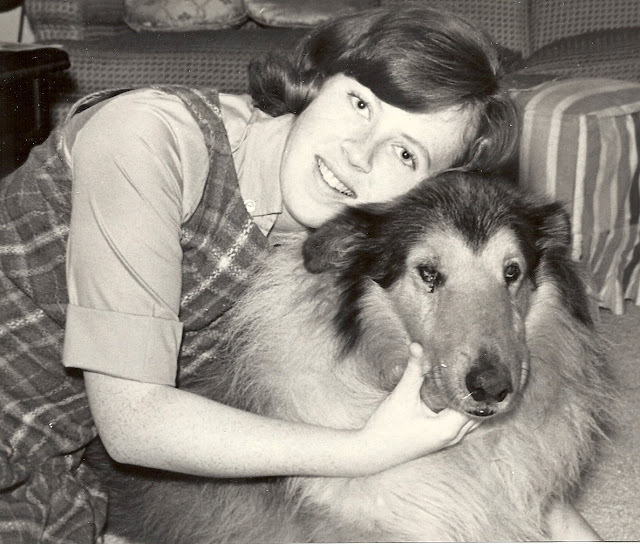 Echo came into my life when I was seven, at the height of the country's obsession with the TV show "Lassie." He looked just like her (she was really a him). 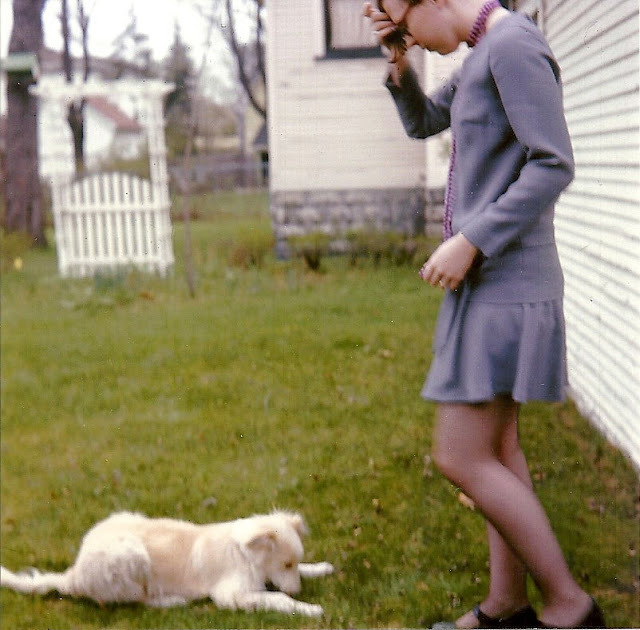 This was also a time when dogs ran free around the neighborhood. 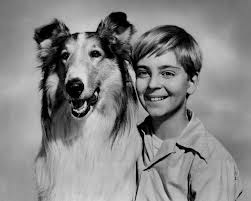 Whenever he appeared, kids would yell, "Lassie!" He was a gentle boy who put up with a lot. In winter, my brother would tie him to a sled and make him pull him on it. I would try to amaze my friends by saying, "See how good he is? You can even pull his tail," and then proceed to demonstrate. I was an aspiring actress and in all of the school plays. But he was never the same after that. I went off to college and Echo spent his days with my Mom and the little neighbor kids she babysat. But he developed a cancer on his eye and then bit a little girl, so my Dad decided it was time to put him down. He called the dog pound (what we called the animal shelter in those days) to come and get him. I knew nothing about this beforehand but happened to be home from college when the truck came. A big burly guy grabbed Echo by the scruff of his neck and his tail, and he was a big dog, and tossed him into the back of his truck. My last image of him was his confused look out through the chain link on the back of that truck as it pulled away. I cried. 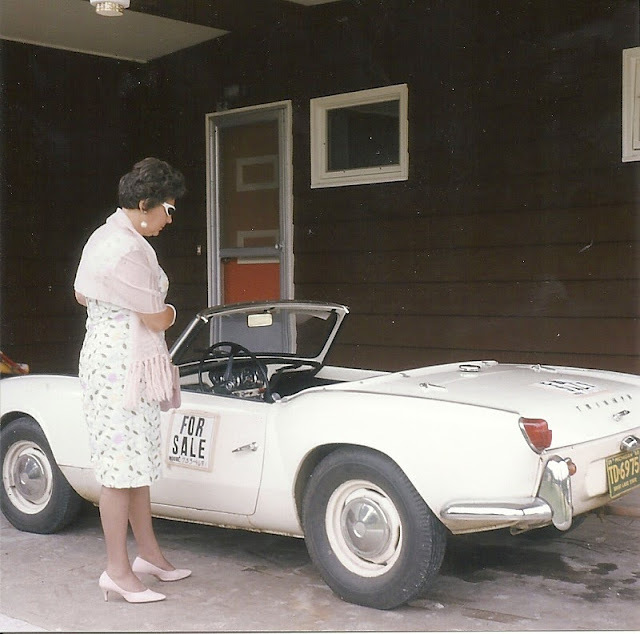 My mother, who never cried and who used to kick him out of the kitchen all of the time for being underfoot, cried. My Dad was nowhere to be found. Later I asked my Dad why he did that. Why didn't he take him to the vet? He was our loyal dog for almost 14 years. My Dad said he didn't think any of us could bear to be there when he was put down. My Dad was a tender-hearted soul so I knew he meant that. But I could have and would have. I never really got over that or the image of that loyal dog being driven away. What I learned from Echo: The unconditional love and loyalty of a dog. I know he forgave us. After my freshman year in college, in fact. My husband was drafted and sent to Vietnam six months after our wedding, so I found myself a sophomore in college, alone in married housing. So what does one do? One goes to an animal shelter and adopts a dog, that's what. I adopted a little white collie mix they had named Casper, after that friendly ghost. Not sure of his age but he was around six months old. I just assumed he would be just like Echo. I didn't realize dogs actually had to be trained and cleaned up after. So I tied him up outside while I went off to my classes. It wasn't long until my neighbors complained about his barking and the aroma that surrounded his space. So I invested in a "Super Duper Pooper Scooper" and decided I would keep him inside while I was gone. When I returned, I discovered Casper had managed to break the window and escape! I was able to find him, but then he did it again! Not easy to explain one broken window to married housing, let alone two. But the second time he did it, I couldn't find him. It was winter and the roads were covered in snow. I called the County animal shelter to see if they had picked him up. I was at least smart enough to get him a name tag. Yes, they had him. They had found his little body in the middle of the road in front of my house. The driver that hit him had called and said he couldn't see him because he had blended into the snow. What I learned from Casper: Taking on a dog is not just about company for me. It's a responsibility that requires time and effort and care if the dog is going to have a good life. and a little white poodle to match (the car people threw him in with the deal) and my Dad was the kind of guy who loved that sort of thing - white car, white poodle, making the daughter really happy. My Dad knew I was sad about Casper and lonely for my husband, so he surprised me with the car and the dog that matched. I named him Caniche, which was the French word for dog. Not long after he came to live with me, I noticed something black on the top of his head. Upon closer inspection, I discovered it was a huge tick. I checked him out all over and he was covered in them! It's amazing he didn't get Lyme Disease! His previous owners had kept him outside in the backyard. I painstakingly removed each and every one. That cemented our relationship! Caniche was a sweet little dog who kept me from being lonely, but life takes its toll. 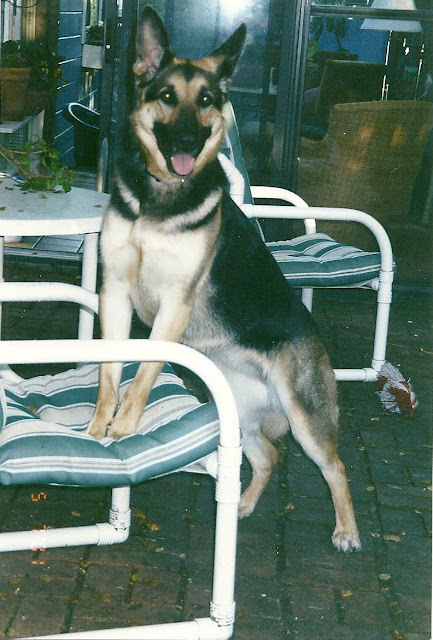 The marriage didn't last and after college, I made a big move from Michigan to California and Caniche couldn't go. I found him a home and left. What I learned from Caniche: His little sweet nature and desire to be a companion to a human began my lifelong love of poodles. I moved to San Francisco right after college. I just missed the Summer of Love, but it was still a happening place, especially for a girl from a small town in Michigan. Missing my little Caniche, I once again wanted a dog. 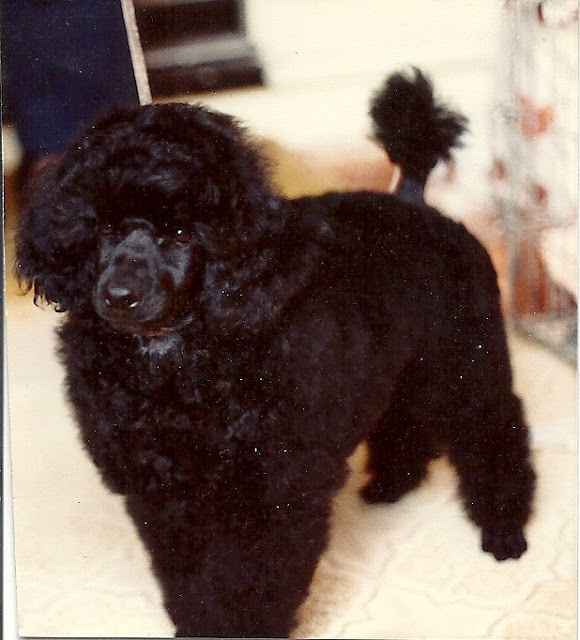 I decided I didn't do so well with white dogs, so I decided I wanted a black miniature poodle. When we went to see a dog I was interested in, out also came another little ball of fluff, bouncing and yipping. A little black toy poodle. I couldn't resist. So we took them both. Gabriel was the miniature and Noah, the toy. Most nights they liked to play pretend bite in front of the fireplace. We lived across the street from the Golden Gate Park and walked them over there. They brought us immense joy and amusement. For some reason we couldn't figure out, little darling Noah had horrible breath. We would laugh when people, seeing how cute he was, would pick him up to give him a little snuggle and then smelling his breath, hold him away from themselves with a look on their faces as if they had smelled a skunk! Who would think such a little darling could have breath that could kill an elephant? When we decided to do a cross country trip back east, Gabriel and Noah joined us in the panel truck, Gabriel sitting on the floor between the seats and Noah on my lap. One time, while my husband was driving, Noah awoke from his nap, stretched, hopped over to my husband's lap and proceeded to have a little poop. Guess he didn't want to defile where he slept. I like to think he was showing his love for his Mom! There is a misconception about poodles, that they are yappy little dogs who piddle in fear. That couldn't be further from the truth. They are one of the most intelligent breeds and when trained and treated properly, are calm and loving. Case in point, it occurred to me after that long trip across country that Gabriel had sat stoically on the floor between the seats for thousands of miles with nothing more than the dashboard for scenery, a dog version of "Zen and the Art of Motorcycle Maintenance!" We had them for almost five years, but once again, my life intervened and took precedence. I had to give them away. I found two neighbors who each took one and promised they could visit each other. And off I went never to see them again. 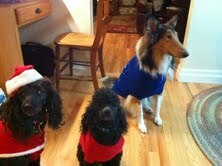 What I learned from Gabriel and Noah: That I would never give another dog away ever again, no matter what. This is a very sad story and every time I think of it, tears come to my eyes. I went dogless for awhile but was settling down, buying a house, soon to have my son. 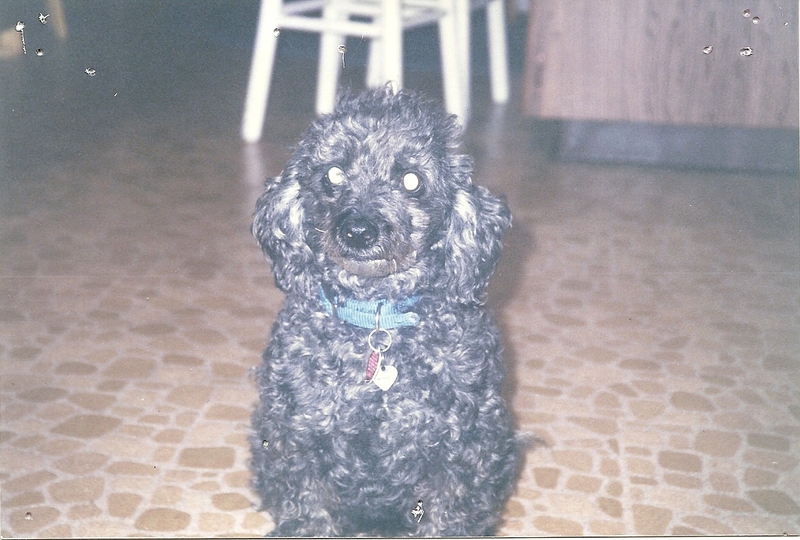 So Gambit came into our lives and he was the most beautiful miniature poodle I had every seen and a very devoted dog. My life started to fall apart, in fact ,and there was a long, drawn out drama that ended in divorce. I was distraught, not eating, trying to hold things together so I could care for my son. Gambit truly felt my pain. I know he did. He stopped eating. He would quietly lie down by me or put his head on my leg. I just didn't have it in me to give him much attention. I was practically catatonic. Then one day, I opened the door and he ran out. He never tried to get out of the house like that. He ran out and ran into the street, a quiet street where cars rarely came by. He ran into the street and was hit by this one car, the one and only car that day that just happened to be coming down the street. I couldn't believe it. I have always felt that Gambit was so miserable for me and for himself that he committed suicide, because he knew I couldn't take care of him and that my life would change and it would be difficult for me to keep him. I know it sounds crazy but there you are. What I learned from Gambit: Dogs feel your pain. When I settled down for good, I wanted another poodle. My husband surprised me with Robin for my birthday. With input from the children, we named him Robin. He wasn't quite as handsome as Gambit was, but he was devoted to me. He slept on the bed and stayed with me until I would stir. I am not known for getting up early if I don't have to, so no matter how long I would sleep in, he was there. Then I would make a little sound and he would come up to my neck and snuggle. My last memory of him was a long hike we took in Garland Ranch Park in Carmel Valley (CA). He was already 15 and was a little trooper, but I had to carry him the last few steps. Robin started having these attacks. He would come into the kitchen and then freeze and cry. 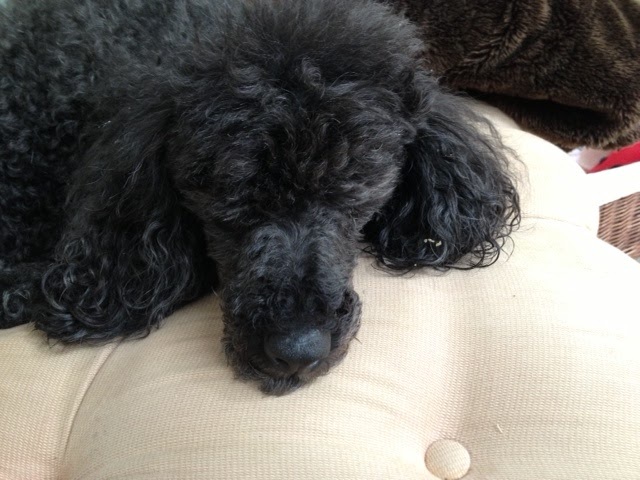 I think he was having seizures, which are not uncommon in poodles. He was also blind, so we decided it was time. What I learned from Robin: He helped me to understand what my Dad went through with Echo and to forgive him. I was a coward just like my Dad had been with Echo. I didn't want to be there when we put him down. My husband took him and was there when he passed. What I learned from the vet: When my husband came home he told me the vet had said we were doing the right thing to put down a pet who is suffering. Many people keep them around long after they should have been put out of their misery. That was comforting. While we still had Robin, we decided we wanted a companion for him. After having Gabriel and Noah, I had long thought dogs that get left alone for long periods of time, such as when we are working, should have a companion. We also wanted a big dog this time. My husband had loved his German Shepherd dogs in the past so that's what we decided we wanted and Gemma came into our lives. 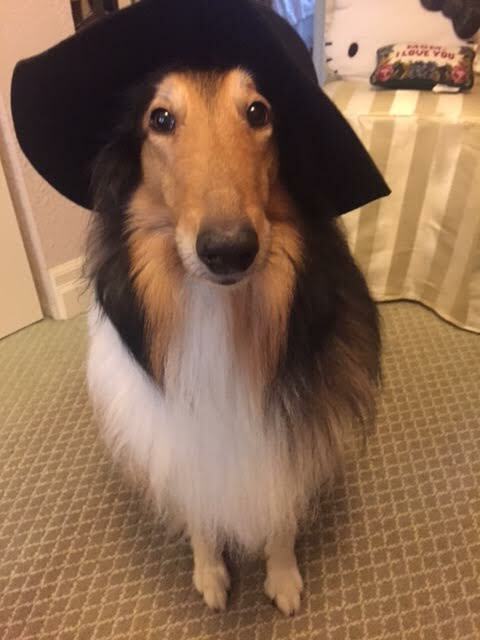 I favor male dogs because they favor me! Female dogs seem to favor the male in the family and that's what happened with Gemma. Of course it didn't hurt that my husband and she played Frisbee together. You haven't seen anything until you have seen a big dog (and Gemma was oversized, even if she had been a male) tracking and accurately leaping for a Frisbee. All you had to say to her was "fris..." and her ears would stand straight up and she would start hopping around. And it also didn't hurt that she and my husband also loved ice cubes, especially the whiskey-soaked kind. As a puppy, we crate-trained her and found out it was a good idea to give the puppy ice cubes instead of water to facilitate the training. That started a lifelong love of ice cubes. My husband finally figured out why she would come to him in the evening and put her head on his knee and look up at him adoringly. When he twirled his glass of whiskey and ice, her ears would stand straight up and she would focus on that glass! She wanted those ice cubes! One day Gemma stumbled coming down the stairs and seemed a bit out of it. The next day I was giving her a treat and she crumpled. We took her to the vet and discovered to our horror that her abdomen was filled with blood. Her liver was affected and there was just no hope. Just like that - two days - it was over. She wasn't even 10 and it happened so fast. Once again, I think there is something between dogs and their humans. I believe she had been sick for much longer than those two days, and she hid it from us so we wouldn't worry, wanting to be the big, strong, protective girl she was. Again, I know I sound crazy, but I feel there is something more going on with dogs/animals than we give them credit for. I can't be concrete about it. I can only share my experiences. Having had so many dogs in my life, each one unique, it is not difficult to think they sense us and feel and act in ways we may not understand. What I learned from Gemma: Dogs look after you in more ways than you know. 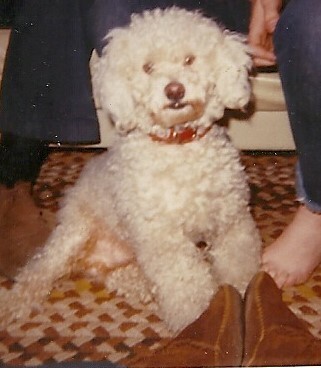 Named after my Dad, Freddy, a miniature poodle, came into our lives after Robin died. 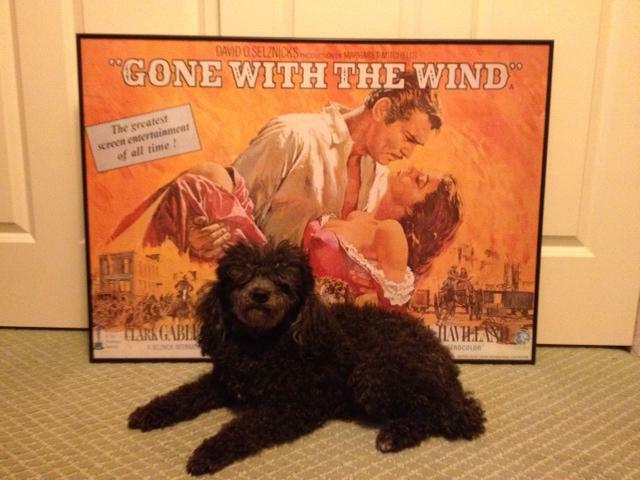 By now, I am sure you realize I love those little black poodles. He started out as a little clown, but when Gemma died, he changed. So we decided to get him a companion. UPDATE: RIP, dear Fred, who died today, September 9, 2017. And then came Tarquin, a little black toy poodle. I named him Tarquin because I had heard that Sir Laurence Olivier's son was named Tarquin and I found that to be such an interesting name I filed it away for future reference. I have to say, Freddy's life got worse as Tarquin wormed his way into my heart. He is the wine-guzzling poodle I have referred to in other blogs. He likes nothing more than to climb up on my lap while I am watching television ("The View" is a particular favorite) and proceed to bump my wine glass until I give him a sip. I know, I know...lest you think I am a bad influence, it's only a little sip (or two). And then we go full-circle. Missing Gemma, we again wanted a big dog, but this time, remembering Echo, I wanted a collie. And I have to say, in the spirit of Lloyd Bentsen saying to Dan Quayle during the 1988 Vice Presidential Debates, "Senator, you are no Jack Kennedy,"
"Mildred, you are no Echo." And she is no Gemma either. Doesn't play frisbie. In fact if you toss her something, it bounces off her head. And she doesn't like ice cubes, whiskey soaked or otherwise. But she is a sweet girl who adores Tarquin who unfortunately rules the roost around here. 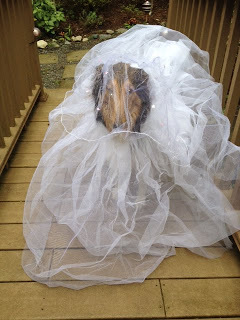 And she is remarkably cooperative when I want to write a blog that features dogs in costumes! What I have learned from Mildred, Freddy and Tarquin AKA the barker, the marker and the troublemaker : Three dogs are a pack. Not recommended. So here I am, retired, in my senior years, empty nest. I could be grabbing my bags on a whim and heading for a fun weekend on the spur of the moment. But wait, what will we do with the dogs? Having dogs is like having toddlers FOREVER. But you know what, I wouldn't change it for the world. We were traveling last week so didn't watch many films. 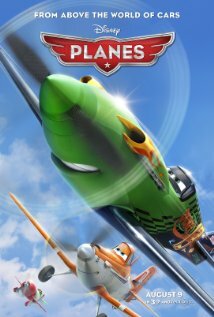 However, I did have the honor of accompanying my two young grandsons to the movie, "Planes." It was a first movie out in a movie theatre for both of them. 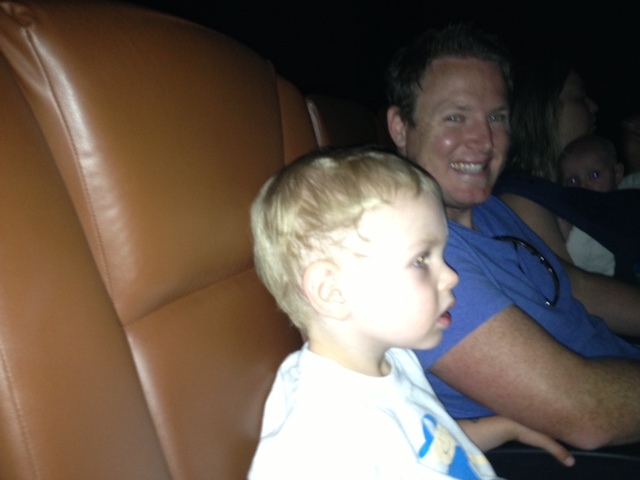 AJ is almost two and a half, and already a huge devotee to the movie "Cars," and Percy is four months, so though Percy was a little angel and hardly made a peep, the movie probably made more of an impression on AJ. In fact, I know it did. I think this is all the review I need to give. He didn't move for the entire movie. Rosy the Reviewer says...not as much here to delight the adults as "Cars" did (according to my son), but the younger set will still enjoy it. I just spent the last week in California where I had lived for over 30 years. Sand Dabs was a particular favorite when dining out, because they reminded me of my "beloved" perch dinners we would have in Michigan. So you can imagine my disappointment when I moved to Washington to not find Sand Dabs on any seafood menus. I was lamenting this fact at dinner out in Monterey with some colleagues of my husband's (while eating Sand Dabs, of course), when one of them looked Sand Dabs up on his smart phone. It said particularly prevalent and popular in Oregon and Washington! Huh? Rosy the Reviewer says... If someone can tell me how to get them here, I would appreciate it! My favorite time of year for fashion. Fall clothes. I love jackets and boots and vests. I find summer difficult because I have to hide flabby arms, ghostly white legs and wear hats to keep off the sun thus leaving me with perpetual "hat hair." But now that I am retired, I can't justify a fall clothes shopping trip nor do I have very many places to wear that cute tweed skirt or faux mink coat. Nor do I have the money now. Rosy the Reviewer says...Darn it! 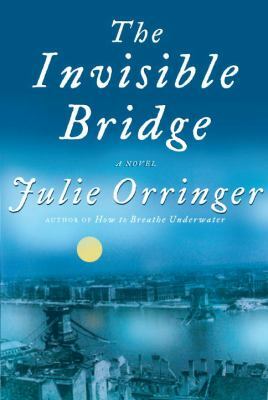 Am working on "The Invisible Bridge" by Julie Orringer for a book club I plan to join next month. It's 700+ pages and it's fiction. Now that might not seem to be a problem for most, but considering I rarely read fiction anymore, it's a big deal. 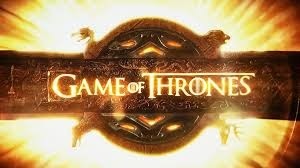 And though the plot is intriguing I am finding the prose a bit overblown with a hint of soap opera. Is this why I don't like fiction anymore or should I keep at it? Rosy the Reviewer says...this first novel is a well-researched love story in the shadow of the holocaust. Caught the touring company of "Sister Act" and it is delightful. Rosy the Reviewer says...if it comes to a theatre near you, highly recommended. Spent the last week in the San Francisco Bay area visiting my son, daughter-in-law and my two grandsons. Had a wonderful time. Rosy the Reviewer says...traveling also makes you fat.